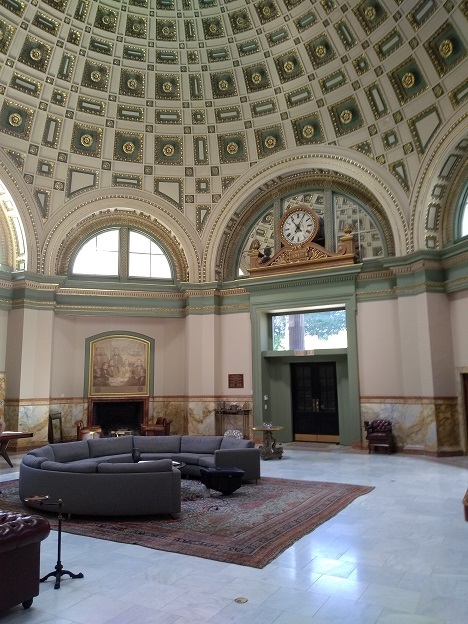 David Coate Consulting (DCC) conducted acoustical tests for a residence Providence Rhode Island, formerly the Old Stone Bank. The photograph above shows the interior rotunda which currently serves as the main living room area. 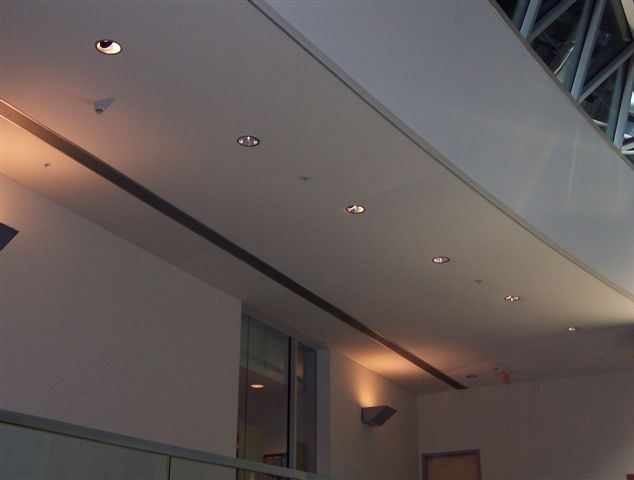 Dome type ceiling structures are notorious for acoustical issues including excessive reverberation and focusing. The hard and reflective surfaces exacerbate these problems. In turn, reverberation causes speech intelligibility issues to the point where speech can become completely unintelligible if the speaker to listener distance becomes sufficiently great. The purpose of our tests was to determine possible acoustical remedies. Another significant challenge for this space is that many conventional acoustical treatments would interfere with the aesthetic design of the gilded dome ceiling and other architectural design elements. Another acoustical issue is the infiltration of sound from the kitchen or the rotunda area into the bedroom on the second floor. The RT60 is the time it takes for sound in a room to decay by 60 decibels. Table 1 shows the results of this test for the main rotunda area. These values (>2 seconds) confirm excessive reverberation and corresponding speech interference. DCC developed an acoustical model of the rotunda based on its dimensions and architectural treatments. The results of this model compared with actual measurements are shown in Table 2. Measured and predicted RT60 values are in reasonable agreement except at high frequencies which is likely due to not accounting for atmospheric absorption which could be significant in this case with long reflected ray paths. Those frequencies do not substantially impact speech intelligibility in this case. Acoustical plaster (such as SonoKrete or Pyrok) is highly impractical in this case because it would interfere with the gilded design of the dome. However, it is analyzed here because many other projects have included absorptive plaster in the original design with intentional architectural aesthetics in mind. Carpet typically does not have enough mid- and low-mid frequency absorption to help in a case like this. However, our carpet analysis assumes that a 40’x 40’ area would be completely covered with a thick carpet and pad. Table 3 shows the RT60 analysis results of these three different approaches. Since the 250 Hz- 2000 Hz bands are the most important for speech, it is clear that the Owens Corning 703 approach has the best results. It is possible to calculate the Speech Transmission Index (STI) based on reverberation time, background ambient noise levels, and speaker to listener distance. Assuming a 2 meter distance, and background noise levels of NC 35, Table 4 shows calculated STI values for each treatment. An STI of 1 would be perfect speech intelligibility and 0 would be unintelligible speech. The results of Table 4 indicated that the Owens Corning option results in the highest speech intelligibility. Bedroom Sound Infiltration Listening tests in the bedroom indicate that a significant amount of sound is coming from the kitchen, up the stairwell and through the metal door into the bedroom. However, there is a gap under the door through which significant sound penetrates. A drop down acoustical threshold would reduce this sound infiltration. The perimeter of the door should be sealed with a bulb type rubber gasketing. Using a pink noise source, DCC measured the sound isolation performance of the large window separating the bedroom and rotunda. That test revealed that the window is at STC 27 which is a low (poor) value. Our analysis indicates that if another layer of ¼” laminated glass was added with a 2” airspace between the glass elements, the sound isolation performance would increase to approximately STC 45. It is suggested that the door treatment be implemented first and then the window treatment if deemed necessary.